NetEnt | The Viking takes on his favourite slot provider in this review! Two decades worth of experience in the industry has paid off for NetEnt. They are now one of the biggest casino game providers in business today. Over the years they have evolved into a worldwide powerhouse. Casino operators appreciate the high quality of each game released. 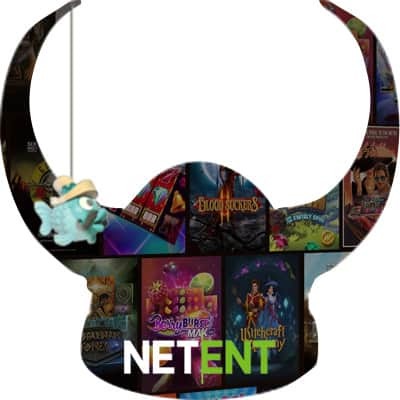 Offering various gaming solutions for online casinos, NetEnt continues to set high standards in the industry. It does this by providing casino operators with branded games that have universal appeal. This is one of the reasons why casinos all over the world turn to Net Entertainment for their games. Another is that the company offers pooled jackpots for certain titles. These jackpots often entice players to spend real money at the casino of their choice. The company is also well-known for its live casino games. NetEnt software allows online casino operators to customize players’ experience. Their live games are optimized for both desktop computers and mobile devices. Casino operators benefit from the services this provider offers. This includes site hosting, staff training and more. They can even teach new operators how to get started developing a new online casino of their own. This also benefits players, because NetEnt knows what they want in their games. NetEnt believes in responsible gambling. Therefore, they are committed to ensuring everyone plays their games safely. Every game the company releases is first tested by various accredited test facilities. These include eCogra, Gaming Laboratories International, iTech Labs and the Technical Services Bureau. eCogra tests all live casino games before they are made available to operators. Gaming Laboratories International ensures each game is secure. The Technical Service Bureau and iTech Labs both test and certify casino games. On the player end, NetEnt offers self-protection tools through its CasinoModule. This is what allows online casinos to provide their players self-exclusion, play limits, reality checks, game speed and visible clock. These tools make it easier for players to restrict their access to online gambling. To support any players that do lose control of their gambling, Net Entertainment contributes monetarily to the Gambling Therapy Organization as well as the UK’s Gamble Aware. They also continually donate money to groups conducting research on how to prevent and treat gambling addictions. NetEnt has won many industry awards for many of its accomplishments. They kicked off 2019 by winning an International Award, as well as the London Global Gaming Award. This is in addition to the EGR Nordics Awards. If nothing else, NetEnt is known for the diversity of its games. The games the company has created cover many genres. They include Retro, Classics, Action/Adventure and so many more. The retro games are nods to past times and include titles like Hotline, Fruit Spin and Steam Tower. These games take players back to a past decade, the origins of slots and a time period that’s enjoying resurgence today. This speaks to NetEnt’s commitment in catering to a wide range of players. Many of the classic slots NetEnt has released, such as Flowers and Fruit Shop, are designed to appeal to players of a certain age. This is the demographic that were playing slots in land based casinos long before online casinos were thought of. When they were, NetEnt knew it was important to attract those players. Their line of classic slots was meant to do just that. The growing list of action/adventure games includes Coins of Egypt, Fire Siege Fortress, Excalibur and Lost Relics. These games thrust players into the kind of action they normally see in movies and TV shows. Other action/adventure slots by NetEnt were inspired by pop culture. This includes Planet of the Apes, Robin Hood, Hansel & Gretel and Jumanji. These are all games that have a built-in audience of players. As the years go by, NetEnt continues to release increasingly impressive new titles. Their game quality is top notch, with movie quality graphics and sound effects. This is true of all their slot machine games. However, their live table games are also visually impressive. They are so realistic that players might forget they are sitting at home. NetEnt’s reputation for excellence stems from its commitment to player satisfaction. Because of the popularity of NetEnt’s games, virtually every online casino in existence offers their games to its players. Some online casinos offer nothing but NetEnt games. As one of the biggest software providers in the industry, NetEnt has a presence all over the world. Its global reach means that just as many land based as online casinos carry NetEnt games. One reason is because NetEnt provides so much support to casino operators. The software provider takes pride in the fact that so many casino operators turn to them for help. NetEnt continues to prove it has what a software provider needs to remain at the top of a competitive industry.